Haven't posted in awhile because I've been too damn busy answering swarm and hive cutout calls! After giving my name to the Ventura County Fire Dept. as a resource, I've been getting 2-3 calls a day, which of course I have to handle after work. Many times the swarm leaves before I can get there; sometimes the "swarm" is actually an established hive entailing a complicated cutout (which I turn down). In the meantime, while I've been capturing swarms, a few of the hive cutouts I did do (one as a favor to a neighbor) immediately absconded after I hived them. A lot of work for nothing. In fact, my experience has been that 50% of the hive cutouts aren't happy with their new home, and take off for parts unknown. That little hive I showed below, the one inside the utility closet? Gone. Same with a HUGE hive I cut out of a neighbors garage cabinet. Three hours of work and one torn veil--- down the drain, they left after one day. I hived all of these into nucs, and the ol' beeyard was starting to get a bit crowded. 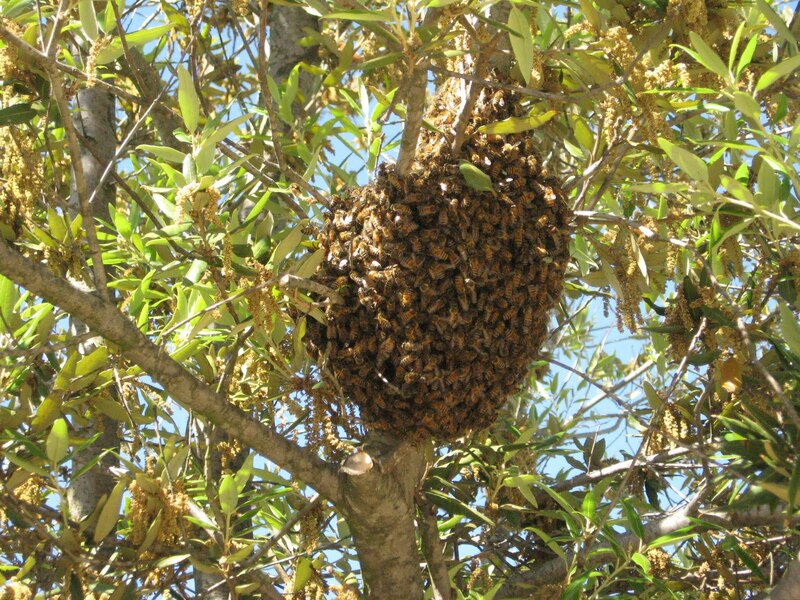 Plus, I was desperate for a location for the swarm I trapped with a bait hive (a hive body filled with frames, and "baited" with a little lemongrass oil to catch a wandering swarm). I needed to expand that trapped swarm to a larger hive, and I didn't want to do that up in the treehouse where the bait hive was! Anyway, GREAT NEWS! A neighbor at a nearby ranch was kind enough to offer an excellent location for a an "outyard," so I moved four of the nucs there on Saturday night. I went back Sunday morning to expand the one hive into a deep hive body, and let me tell you, they were PISSED OFF! 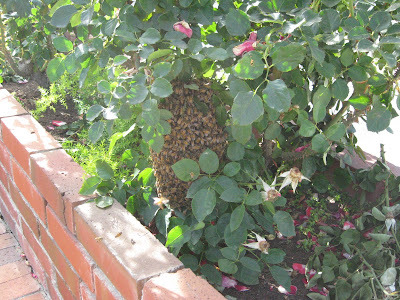 Sent all my audience (some of the folks from the ranch) scurrying for cover, and I literally had to go for a walk before the bees would stop head-butting my veil. I then had to sneak up on my truck and take off, because I didn't want them finding me again and getting in the truck with me! I got the hive transferred into a deep, but had to leave the old nuc body there. It still had a generous number of bees, and I just didn't want to shake them into the already boiling-mad hive. So, I left it in front of their new home, and I'll go back next week to retrieve it and see if the hive has settled in. The other three, by the way, did just fine with the transition. I'll take some pix of the new location for my next post.